With all of the rain we've had around here over the past week, I thought it was time to see a rainbow! This one is from the Concord & 9th Rainbow Wishes stamp set. I paired it with the current sketch at Freshly Made Sketches. The layout's large panel was perfect for showing off the stamped rainbow! I inked up each of the arches individually and stamped them on the white panel, starting with the red and moving on through the color bands. For the sentiment, I stamped "you're a bright" directly on the rainbow. I die cut a cloud from shimmery white cardstock using the coordinating Rainbow Wishes dies and stamped the rest of the sentiment on the cloud, then used foam tape to adhere it to the panel. A few clear jewels arranged around the cloud add a bit of sparkle to the design. The panel was matted on silver cardstock, then adhered to a light blue card base over a light blue dotted panel. I’m with you.....too much rain here as well! I am ready for a sweet rainbow like this! Glad you joined us at FMS! 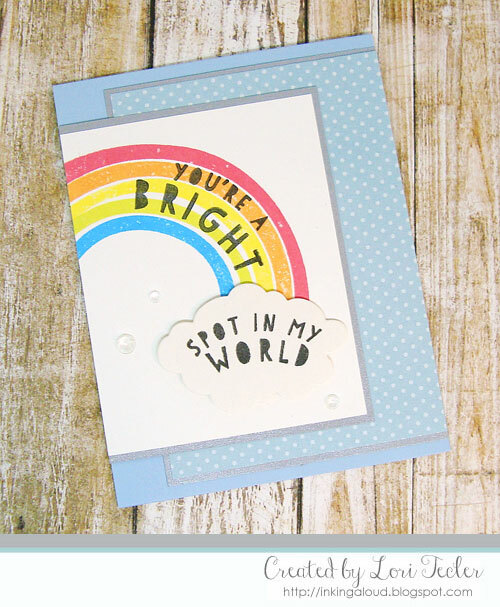 Your rainbow looks fabulous and adding the sentiment on top is such a fun look! Thanks so much for joining us at Freshly Made Sketches.